Can Peace Overtake The Violence In Kashmir? The choreography of violence is being staged yet again in Kashmir. This time the spark lighting the accumulated tinder has been the killing of a popular militant leader. And the elected leaders cowering inside their guarded residences bear silent testimony to the cogency of the state’s democracy. Crowd control is not the usual remit of the military. Yet long periods of occupation with a restive, angry population requires an iron fist. Even in Israel rubber bullets are preferred. Not in Kashmir, where live fire is their response against rock throwing young men. This time the official casualty count is 36 killed and 1500 wounded — a little too lopsided a ratio and no doubt the killed column will keep increasing as media attention tires. Estimates of civilian deaths since the troubles began range from 40,000 to 100,000. Why is life so cheap? With avenues to a normal life closed for the most part, young men have not much to live for, while the trigger happy security forces often suffering casualties among their own comrades have little love for the Muslim Kashmiris. Small wonder then that India refuses to hold a plebiscite allowing Kashmiris to decide their own fate, a plebiscite mandated by the UN more than six decades ago. And so the stalemate with Pakistan, where up to recently the nuclear weapons (as in India) were never on a hair trigger. That has changed. In response to India’s new ‘cold start’ doctrine — meaning the Indian army groups at the Pakistan border always attack ready without the two or three day (or more) marshaling of forces — Pakistan has placed small tactical nuclear weapons in the hands of local commanders … while India maintains use of any nuclear weapons will bring a strategic response, namely nuclear ballistic missiles. Is the world ready for a nuclear winter? Clearly not. 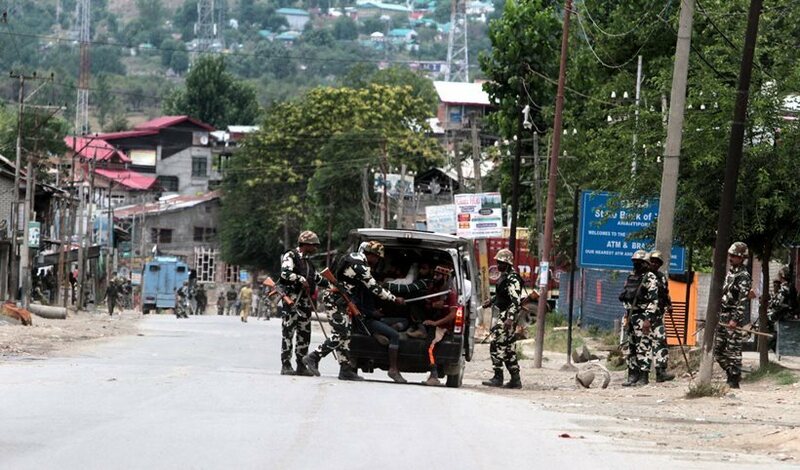 Yet the crux of the problem, Kashmir, appears insoluble, at least in the foreseeable future. The closest anyone ever came was Pervez Musharraf. Soft borders without altering maps to anger constituents was the central idea. Unfortunately, Manmohan Singh, his counterpart, hesitated. And then Musharraf, left too long with his own advisers, got cold feet. So what are the options now? The status quo, but that is the problem. In a plebiscite the Kashmiris tired of a repressive security apparatus are likely to vote against remaining tied to India. That, India is unwilling to accept. It is also the real reason India has reneged on its 60-plus year promise to hold a vote. One can of course add a third option, namely, a politically independent Kashmir. The bitter pill of lost political control will have to be sugar-coated with the Musharraf-Singh soft borders but without the two countries’ joint control of Kashmir’s resources. Over time, as in the case of Europe, trade and its economic benefits will diminish the draw of the nation-state. As it is, global trade agreements are already eating away at the legislative powers of individual states. Look at NAFTA and the proposed TPP. In longer memory, current disputes will appear trivial and the sub-continent might even have a shot at catching up in per capita GDP with independence contemporaries like Malaysia and Indonesia. Even Sri Lanka despite a long civil war is way ahead. Dr. Arshad M Khan (http://ofthisandthat.org/index.html) is a retired Professor. A frequent contributor to the print and electronic media, his work has been quoted in the U.S. Congress and published in the Congressional Record.